Here we go. Balance of texts has caused all kinds of gnashing of teeth. In early Common Core documentation is a chart that stipulates percentages of fiction and non-fiction to be read a specific grade levels, and that by high school students should be reading mostly non-fiction. English teachers despaired of teaching their favorite novels and somehow people got the idea that kids were going to be reading only technical manuals. As an aside I should say that even most of the Common Core developers have disavowed some of the content in Appendix B and Appendix C of the Common Core State Standards. Any time anyone offers a list of exemplars, there is someone else standing on the sideline ready to lambaste the choices. The texts in Appendix B are offered as guidelines; there is nothing mandated. However, just as there are those anxiously awaiting the opportunity to take potshots at someone else's list, there are those who are equally anxious if there is no such list to guide them. It's a wonder anyone offers any kind of suggestions or recommendations any more. Anyway, the balance of texts is throughout the school day. Students need to be exposed to a range of texts through the school year: fiction and non-fiction and different genres within each. They also need to be given access to texts at and above their comfort reading levels. Inviting them to read something that may seem harder gives them the opportunity to learn how to stretch, how to read harder texts, and how not to be afraid to try something harder. Text complexity is one of the ways to talk about texts that are "harder." Text complexity reminds us there are many factors that make a book hard for a reader. Contemporary students always struggle with older books, and by older I mean stuff written in or before the 19th century. The language conventions are weird, the sentences and paragraphs are often longer, etc. Not only that, authors are writing about a world with which today's readers are unfamiliar. We can't blame students for wanting to know why they need to understand the world in which a 17th century writer lived and wrote. That's the qualitative. The quantitative is the readability of the book. Publishers and others go through all kinds of exercises to let teachers and parents know the readability level of a book. Whole industries have been built around beginning readers and subsequent levels. Once upon a time kids read what there was. While there is some dispute over the first children's book ever, it did take a while for books to be written specifically and exclusively for children. In the 19th century we saw the rise of books that "appealed" to younger readers, among them The Swiss Family Robinson, Oliver Twist, Kidnapped, Alice in Wonderland, and The Adventures of Tom Sawyer. Note the word "appeal." That hasn't really changed in that kids read for pleasure that which appeals to them, captures their imaginations, gives them something to Tweet or Vine. They read less because it was the right reading level but because they liked the story or the writing or the characters or all of the above; or their friends were reading it. As for books students read in school and for school, the challenge is often that the reading level (quantitative) is not the same as the appeal level (qualitative). But if students are exposed to a range of texts and the range refers not only to quantitative and qualitative, then kids are likely to be stretched not only at the reading level but at the appeal level. But far too many kids don't know what else appeals to them because they've never had the opportunity to read something outside of that particular comfort zone. Text-dependent questions, evidence-based answers, and academic vocabulary have some strong connections. Presenting text-dependent questions should be a lot easier than it seems to be for most educators. This section could actually warrant its own blog post and/or SlideShare presentation. I'll have to think about that. 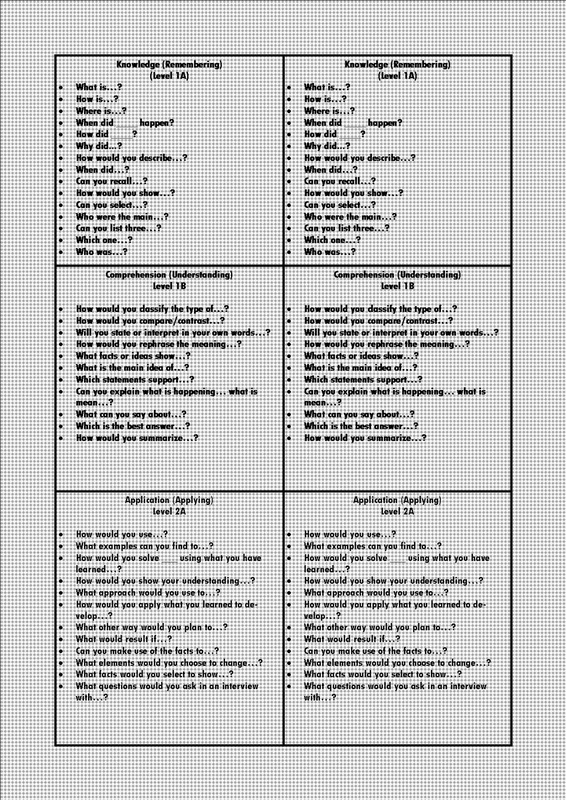 Anyway, many educators use Bloom's Taxonomy as a resource for figuring out how to ask questions at higher levels of critical thinking. That is, how to ask "good" text-dependent questions. There are a few dozen resources for question stems based on Bloom's Taxonomy one of which can be found here and another is here. The keys to text-dependent questions are: 1) they are not "yes" or "no" questions and 2) they require students to refer to the text which means they will have to a) read closely; b) be able to make inferences; and c) find textual evidence to support their claims. You might recognize that as part of the first Anchor Standard for Reading. So when students are asked text-dependent questions, they should be able to give evidence-based answers. Now the evidence-based answers shift isn't just about kids being able to pull from a single text, but to learn--over time--how to build evidence from multiple texts. And that means they will have to learn how to analyze and synthesize texts. They will need to know how to paraphrase; they will need to know how to test the validity of their sources. To do some of that work, students will need to be comfortable with academic vocabulary and that means that they know what a summary is as well as how to summarize. Academic vocabulary represents vocabulary that is not necessarily common but that students are likely to encounter with some regularity in a school setting. 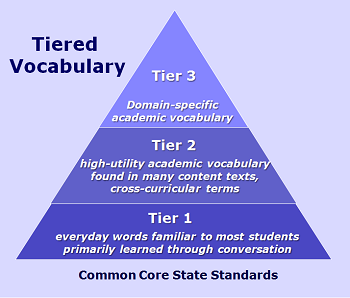 Common Core tells us there are three tiers of vocabulary and academic vocabulary is Tier 2. Practically speaking, some vocabulary might be both Tier 2 and Tier 3. The point is that educators cannot assume that students know and understand some of the terminology we use regularly. By the same token, we have to keep in mind that some vocabulary has different connotations in different content areas. But that really is a different post and/or SlideShare. 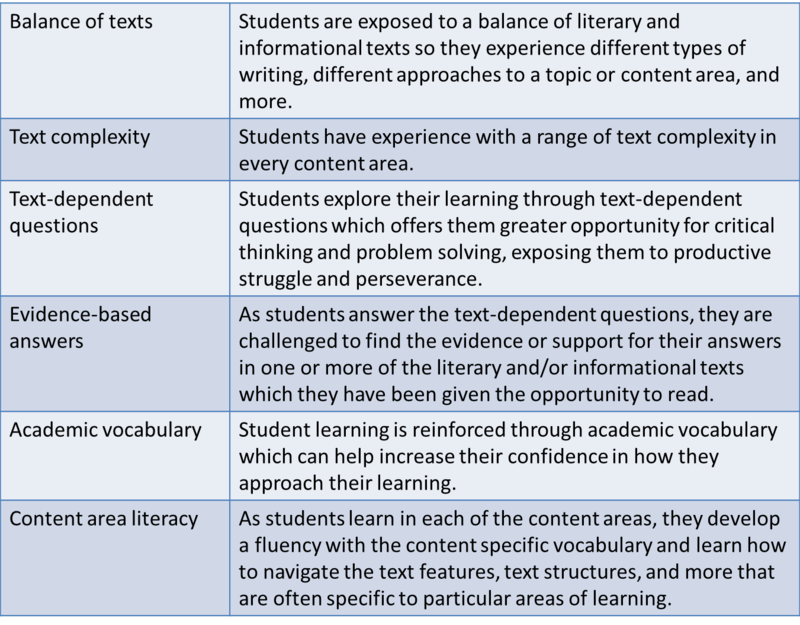 I believe that content area literacy is an overarching essential concept for the instructional shifts. If a student is to understand science, the student must be familiar with the content- or domain-specific vocabulary in that area of science, must be able to discern any differences in the use of that term in a particular science class with the use of that term anywhere else, should that situation arise. The student must learn that writers in science have a different style and tone than other content areas (qualitative) and that the more complex the scientific ideas, the more complex the concrete and the abstract elements of the text (quantitative). Students can be exposed to content area literacy through a range of non-fiction texts, not just their textbooks, and might even have opportunity to learn from fiction. And now I can approach that third element of text complexity: reader and task. My favorite part of that description is "complexity generated by the task." What this says to me is that I might be able to use a Magic Schoolhouse, National Geographic, DK Publishing or other resource to enable and empower kids to explore something in science, and that opportunity to work with a picture book or some other kind of text might spur students' imaginations and desire to learn. Those texts might be bridges to connections students might not otherwise see or make, and they might yield an excitement about learning. I have often said and have often been affirmed in my thinking that we cannot underestimate the power of a picture book. Sure, you're not going to use a picture book all of the time, but keep in mind who writes those picture books and why they write those books. In terms of text complexity, that picture book or non-fiction supplemental might seem "easier" because of its reading level. But it's not the text, but the task. If I'm asking good text-dependent questions and expecting strong evidence-based answers, and if I'm inviting my students to use a range of resources to find their evidence-based answers and find additional support for their evidence-based answers, then the task is more complex and students learn better how to use a range of resources. A supplemental activity is step away periodically and ask students to assess the resources they're using and have them tell you which texts they think are complex, and why. I suspect you will be surprised.